Develop your skills with Precision Tennis. 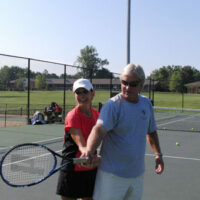 The Precision Tennis Adult Program offers a variety of instructional programming for the beginning player just picking up a racket to the league player, to the experienced, tournament level player. Drill Classes: Focus on drills, tactics and strategy for developing players with some experience. Classes are fast moving, insightful and fun! Ideal for women with experience as a 3.0 – 4.0 USTA Rating. Classes led by Director of Tennis Dave McCain. Interested in learning more or would you like to start? Drop-ins are welcome!